This entry was posted on Monday, December 8th, 2008 at 23:50 and is filed under Technical. You can follow any responses to this entry through the RSS 2.0 feed. You can leave a response, or trackback from your own site. I was having the same problem with a Vantec CB-ISATAU2 PATA/SATA-to-USB2 adapter (random data corruption when reading through the adapter, especially with big files). After reading your post, I opened it and removed the R15 (4K7 R) connected between GND and Pin 34 of JM20337. It worked too. I tested with SATA and PATA HDs, with small and big files (+700MB) and until now, no more signs of corruption. A big thank you from Brazil. Thanks for this hardware patch. Also works fine with the Akasa AK-ENP2SATA enclosure. The circuit board (SkyCable CO.,LTD 350 USB_SATA REV:1.7) used in the enclosure is a little different from your picture. But the resistor that has to be removed is also named R15 on this board. I really was lucky that I had a backup of my digital pictures. About 2 percent of this files where already corrupted . I really don’t understand why this problem was not detected before it was release to customer. Thanks for the patch! It also works for me on the HW-338 PCB using the JM20337 chip. Though the position of R15 is different from yours, I just followed the circuit printed on the broad and found out the target resistor I need to remove(also named R15). Now, the adapter seems working fine! Thanks for a brilliant solution of an incredible problem. So we have several manufacturers and all of them use the same resistor, same place, and call it R15. Supposedly they were told so by JMicron, it’s not their fault I’d say. And no recall, no word, nothing, although they new the problem, and new it’s hard to notice, but cocequences for data could be hard. So I testet memory, disk, everything until it came to the box. I am lucky it wasn’t my backup disk. http://ribosome.natur.cuni.cz/~mmokrejs/JMicron20337/UMAX-UniCable-SATA-and-IDE-to-USB.jpg . There are few more files at http://ribosome.natur.cuni.cz/~mmokrejs/JMicron20337/ . My own follow-up. I just took a knife and pushed away the resistor from this sucking device. Yes, that has finally helped out. My last experience was under thread “[usb-storage] linux-2.6.29.3: (Unknown Key): (unknown ASC/ASCQ)” on June 10 2009. At least I have managed to copy my 160BG drive data another without the JMicron controller being disconnected. Reporting back after 4 months – the device works flawlessly after this patch. Also glad to find my blog post useful. This post was really useful for us, thanks again, but there must be thousands of these adapters, and I am trying to imagine how many people now have corrupted data without noticing it. The kind guy from JMicron instead of answering only to you, and blaming box manufacturers, could tell his bosses to publicly disclose this problem. We are lucky few having noticed it, and then read your nice post. Very useful info indeed ! Thanx! And when i opened it to check what actually is the chip inside, i did not see any ‘R15’, so maybe this one is imune to read errors?! I hope ! Kalin, have you realized that the UK re-seller has this not regarding your adapter? Which edition do you have? Note: The current reference number for this product is the VE328 but it was formerly referred to as the VE225 – its only the model number that has changed! It has to be a batch of larger files, let’s say 100mb+, and then some of them get corrupted. It’s hard to notice or find in a video or audio file. Download Windiff app., it compares bit by bit, and finds difference. Or compare MD5. And it happens only when copying f r o m the disk in my experience. Hi again and THANX for the .bat file ! If im right if U type the CMD line like above, the batch file will copy the file TO the external HDD, yes ? In my original script it will copy file to USB HDD, then will _read_ it back using FC, so no need to swap destination drive. FC is reading from both source and destination path to memory then compare binary. However, swap is also fine. 2.6.26-2-amd64 kernel, found data error. Can you somehow populate this post, so if someone search for solutions, find it quicker? usb 1-1: Manufacturer: Sunplus Technology Inc.
Thanx a lot! It really works! I have sata/ide-usb combo cable made by Trifoo http://img99.imageshack.us/img99/6047/15381895.jpg . I’ve also found a R15-named resistor on it, so I went to a mobile-phone repair shop and asked them to remove it. I’ve copied nearly 100Gb data to a connected sata-HD, and copied that 100Gb from same sata-HD to it’s another directory. Compared the sha256 hashes of all files, no corruption. Both have the JM20337 chip, but I think that they also use other chips on some adapters. After removing the resistor the problem never occurred again. The resistor is also called R15 but it’s not on the same side as the JM20337 chip. Fortunately SATA hot plug isn’t really needed as it only disconnects the current usb device and detects a new usb device (the new hd) on connecting or disconnecting the SATA hd to the adapter. This can also be reached by manually disconnecting and reconnecting the adapters usb cable. But be aware that your computer doesn’t notice the change if you swap the SATA hd and don’t reconnect the usb. I have the same Akasa AK-ENP2SATA enclosure as Bernie (2nd. post) and mine also started to fail recently. Just removed the offending resistor and I’ll see if this solves the problem (I’ll report back). It’s appalling that several enclosures from different manufacturers using the same JM20337 chip and nearly identical circuitry are still being marketed. It’s interesting to note that googling around I’ve found that most of the discussion about this problem is on Linux. Yours is one of the few discussing (and solving) the underlying hardware problem. Many thanks. Tested both ENP2SATA (http://www.akasa.com.tw/update.php?tpl=product/product.detail.tpl&no=181&type=Enclosures&type_sub=3.5%20Enclosure&model=AK-ENP2SATA-BK) and P2NES (http://www.akasa.com.tw/update.php?tpl=product/product.detail.tpl&no=181&type=Enclosures&type_sub=2.5%20Enclosure&model=AK-ENP2NES) and they were corrupting data (I’m using a 4.4 GB file). Removed R15 from both and so far they have passed 220 and 150 cycles of writting/verifying without problems. I think they’re fixed. Many thanks again. Thank you very much for this fix ! I have two usb/ide/sata adapters bought on ebay that have the same corruption problem. After remove the resistor on twice adapters, all work perfectly. I have 2 USB to IDE/SATA cable adapters that use the JM20337 chipset. One of them is malfunctioning – the 3.5 port recognizes the HD with a strange name and indicates it’s not formatted; only the SATA port works – I haven’t tested the 2.5 port. I have opened and it uses the circuit layout with R15. But I don’t use this cable anymore. I have bought a similar looking cable and have noticed the corruption problem. I opened the connector and although the JM20337 chip is there the circuit layout is completely different and there’s no R15!!! Can anyone help me to solve this issue? My Akasa ENP2SATA enclosure functioned OK for a while after I removed the R15. Last week I noticed the corruption problem again. Now it went to right place where it belongs: the thrash bin. The final solution: just bought an Western Digital MyBook external hard drive. Working fine. I’ll never more buy these cheap enclosures. Mr. Alex Lee was not as forthcoming as you think. He only told a minimal amount of the story to deflect blame and save face. I appreciate your digging up this information about the errors. The reports and discussions back then did not explain WHY errors were occurring, but it was known that errors were occurring, and the worst part of the story is that these errors were not being reported properly by the chipset, and as a result were not being reported as data corruption errors by usb mass storage drivers. That is indeed a bug in the chipset. While this bug has been worked around in at least some drivers (such as in the linux kernel) your experience shows that other drivers failed to be fixed and updated. Has JMicron silently redesigned this chipset without a name change? Doubtful, and of course they are doing nothing that would publicize the flaws, and they keep selling this buggy chipset. A shameful but typical corporate response. They are not deserving of your plaudits. To Sergio: the JM20337 has indeed been used in some MyBooks, probably not newer ones though. Many thanks to Matt Black for enlightening this discussion. When I first noticed my enclosures where corrupting data I googled and found many discussions on Linux forums (such as the one Matt’s pointed out) but thought (wrongfully) they were specific to Linux and not hardware related. I’ve been publicizing the JMicron bug in every forum I’ve been to (and linking to this blog which seems to be one of the most comprehensive). @ Matt Black: what a fright you gave me!!! I just checked my MyBook and it’s VID: 1058, PID: 1100, meaning Western Digital. I’m safe. JMicron 20337 rubbish is VID: 152D, PID: 2338. Everybody who are having the JM20337 IC. Does your board having this chip, Spins-Down your HDD when it is in idle/standby or when you Safely Remove it? I have a noname external case (3.5″ SATA+IDE BOX). Is it compatible and will i also have problems? How can i check, if i have problems? I have the thrird Seagate Barracuda 7200.10 500GB now destroyed in the warranty (to hot, on Transistor on platine burned). I have them normaly intern in the PC but sometimes inside the case. I will have to copy all Datas on this new disk. is this Chip capable for 1500 GB or where is the limit? The idea was a RAID1 inside my “ASUS P4V800D-X.” But still don’t know it it has a limit with the size of a new HDD. Thank you for posting this solution and saving my nerves. This problem was driving me crazy for some 6 months. After getting rid of Akasas’ AK-ENP2NES-BK I got A C Ryan HD50114. Board revision 1.0 worked flawlessly, but board rev 1.1 needed this fix. And now it works fine! SISTEMA: WINDOWS VISTA. MEU HD EXTERNO IOMEGA SCREEN PLAY 1 TB ST31000340 AS USB DEVICE DEU PROBLEMA COM QUEDA DE ENERGIA E AGORA RECEBO A MENSAGEM “ERRO DO DISPOSITIVO E/S”. NÃO CONSIGO LER MEUS ARQUIVOS, POIS O WINDOWS NÃO CONSEGUE LER. O QUE FAZER PARA RECUPERAR OS DADOS ? Tanks! You save my day! Nesse caso, acho que você deve procurar uma empresa especializada em recuperação de dados de HD. Carmino had a HD failure. I suggested him to seek for specialized people in order to recover his data. I am having the same problem with Enermax Jazz EB307C-B aluminum 3.5” HDD enclosure. I bought the enclosure about 2 years ago and it was working intermittently. Sometimes it works nice and the next day it corrupts the data or I cannot even see the harddrive. It uses the same crappy JM20337. Unfortunately, this one has a 4k7 resistor that connects pin 34 to +Vcc and not to the ground so, based on what I have read on this website I should not have any problems. Yet, I still have. On this board the famous resistor R15 is not connected to pin 34. The resistor to pin 34 is R21. I contacted Enermax and they suggested me to contact the Canadian company that takes care of this product. That Canadian company said they do not cover it as it is out of warranty. I contacted Enermax again and wait for an answer. I will keep you post it. In the mean time any suggestions? Don’t bother trying to fix it. Just get a new one of a reputable brand. The test script may not work reliably on modern Windows systems, particularly if you have large amounts of RAM. This is because Windows heavily caches file I/O and the fc comman may end up reading mostly cached data. I have a cheap TriFOO IDE to USB 2.0 Adapter with JM20337, and I almost bought a new one when I saw it has byte errors. But meanwhile I found this post and I tried to desolder the resistor. It seems to work fine now! xcopy on Windows XP doesn’t have a /J switch. Removing the resistor didn’t work for me! I’m quite sure there is no real solution to this bug (other than buying a good enclosure from a reputable brand). Thanks a lot for this solution. I’ve been trying to upgrade the hard drive in my PlayStation 3, and I’ve been getting the error 800283E7 on every attempt to restore my files from backup. The error appeared at a pretty much random moment. By the process of elimination I decided that it was the enclosure to blame. I checked that it had the JM20337 chip, and after some googling I came to this page. I was about to lose every hope till I read this blog. I backed up all my PS3 data and dabbled a bit with installing Linux and decided that it was not for me. I formatted the PS3 and tried to restore from my Akasa enclosure backup only to reach 7% and stops as the data is corrupted. Tried many things only to stop at the dreaded 7% mark. Removing the R15 resistor did the job. Now the children, and I, are very happy. Do not know how or why did it work and do not care, but the problem is I could have easily given up and wiped the backup as I thought it was faulty during the writing from PS3 to the USB enclosure. It never occured to me that it could be hardware. Many many thanks to you and to the chap from Jmicron who tipped you about the solution. My A.C.Ryan AluBox enclosure (HD80304) had minimal corrupted data about every 300 – 400 GB. Thanks to this blog I tested the box actually. So I cutted the track to the resistor to Pin 34. After that last night the enclosure worked without any error so the problem is probably solved. But after Sérgio’s experiences I am suspicious und will test for 2 or 3 further days. At first many thanks for the (probably) solution. I have a sansun usb 2.0 sata pata combo box and I have multiple situation of read/write data corruption with this chipset. I open it but my R15 is 103 (1K3, i think) instead of your that is 472, but there only one resistance of 4K7 and is signed RD4 like RD4 of your circuit board. I can’t see what is connected to pin 34 because the line is under the chip. Any suggestion or similar box already fixed? Thank you very much for posting this, it worked on my WLXKY-8280 V1.2 USB to SATA, IDE adaptor. Removing R15 @4.7k did the trick for me. Previously I was experimenting with the termination circuit trying to get the error rate down. I would like to see the full data on this chip does anyone know where to download it from? what pin of the ic is the r15 resistor connected also what is the other end connected to can you tell?. ho see above its p34 whats p34 for? I ran in something very similar with the Inland Pro IDE/SATA/USB harddrive adapter from Microcenter. I fixed the problem in a similar way. There would have been NO way I could have fixed it without reading this post. As I said in a comment some time ago, I also have the Inland and didn’t know how to solve the corruption problem as it doesn’t have R15. Following your advice and taking out R13 the problem is now solved! Thanks for the tip!!!! Yes I have now repaired several of these USB to IDE and SATA converters built around this chip all of which suffered from the data corruption problem. When testing these devices it is important to use a test file that’s much larger than your computers memory size to prevent the data from being fetched from cache. Interestingly the data error rate is not the same for all of the seemingly identical designs, with some giving an error rate of one error every 2-3 Gig where as others give an error rate of one error every 10 Gig or so. Removal of the resistor R15 4.7K (472) cures the problem in every case. Removal of this resistor also stops hot swapping on the SATA drive, but it is not much of a hardship to unplug the USB cable when changing the SATA drive. The power supply unit that comes with many of these USB converters is also of low quality with an under rated power switch that gets welded closed after being operated a few times. Thanks, it solved my problem aswell. I got mine (USB 2.0 TO 3.5 SATA IDE HARD DRIVE IN 1 CABLE ADAPTER) at ebay (seller dragonext), it seems to be worked fine with SATA disk, but once I plugged an IDE disk I started experiencing the random erros reading from it. Even easier… and this works on ALL devices using this chip. Heat and pry up pin 34 with a sewing pin or dental pick. I’ve fixed all of my JM20337 USB adapters this way. Thanks for this. Your hack fixed the problem on a Max Value mv11130 usb sata/ide external drive case I bought from Amazon.co.uk a few months ago. I’ve only used it under Linux. The circuit board was different to your picture and the r15 was in a slightly different place, further to the right. The board was marked “g5m 350 usb_sata”, revision 1.7 . Like Warl0rd, I just heated up the soldering iron and pushed on the r15 until it came off. Bingo, no more read errors! Same problems with CATlink “CL-USB202”, i use Linux. After reading your post, I opened it and removed the R15 (472) connected between GND and Pin 34 of JM20337. It helped my adapter too. I test with Seagate PATA 10G drive, whole disk in one pass and until now, no more signs of corruption. I just bought a new enclosure (Speed Metal 3.5″ USB 2.0 Aluminum External IDE/SATA Hard Drive Enclosure (Copper) ) and, after noticing some data corruption I opened it. There it was JM20337 again… anyway, no R13 and no R15. The resistors marked as 472 are: RD6 and RD4. RD6 seems to be linked to pin 34 on the JM20337. I know the board I have might be from a different revison, but after looking in the TF002 schematic, there are two 4.7K resistors linked to pin 34 (GPI02 function, related to the SATA hot plug), R4 and R6. I am tempted to take out RD6 but I’m not sure I should do it… help, anyone???? Why don’t you give it a try with some data that you don’t need? You can always put it back. It should be easy to identify the correct resistor to disconnect, there should only be one resistor connected to pin 34 AND ground. Double check again. Ok,using the multimeter I found out RD6 was between pin 34 and ground. Took it off. I’m currently doing a file comparison to check if the errors are gone. Here’s a picture of the board with RD6 highlighted. From what I can see in the picture it looks like the right one. Can you post a higher res picture of just the area around pin34 and RD6. Test done, no errors. This backup was done before I had taken RD6 out so this conforms the corruption is in the reading and not in the writing process. I have the higher res pic inside the camera, as soon as I have time I’ll upload it. I can see you happen to be an expert at your field! I am launching a web site soon, and your info will likely be quite exciting for me.. Thanks for all your support and wishing you all the success. Fairly decent submit. We simply located your own site as well as wished in order to express which We have extremely appreciated reading through your own web page as well as threads. However I’ll end up being signing up your own give food to as well as We intend in order to read through your own web page for a second time. I had a trouble with one SATA & PATA to USB adapter. It hangs and gave me the error: “Device disconnected…” Today I’ve searching for JM20337 and I found this topic. …saw R15 is the same resistance and remove it from the board. The adapter now is fine working. It is “Crystal SATA/IDE to USB2.0 Adaptor Kit” blue carton box. It looks similar to SATA to USB adapters in ebay. There realy are a couple of layouts with the same parts and schematic diagramm. I have modified several different types of these USB to SATA and IDE boards by removing the resistor R15 4.7k and in every case it fixes the data corruption problem. Unfortunately in every case it also stops the SATA port working from seeing the SATA drive. From what I have been able to see that by removing R15 you are preventing the Jm20337 chip from loading data from the serial memory device at power on, stopping any manufactures customizations from being loaded and also unfortunately stopping the SATA port from working. Has anyone got any better ideas of how to fix these devices so that both SATA and IDE works correctly? 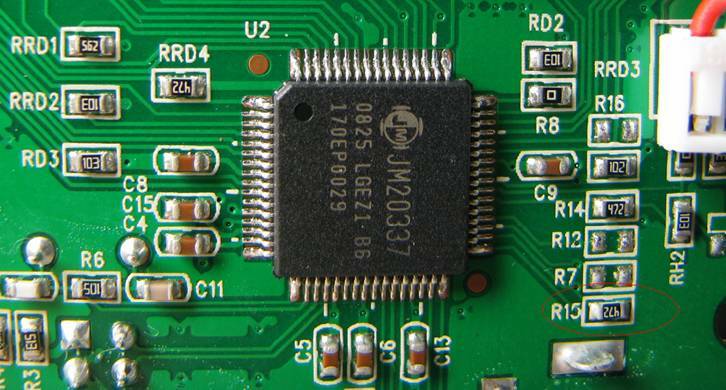 Does anybody have the full datasheet for this JMicron JM20337 controller? My enclosure went dead and I want to debug it. I have the full data sheet, but unfortunately I cannot give it to you as I had to sign a non disclosure form to get it. I don’t think that it will help you much anyway. I got the data sheet by simply e-mailing jmicron and asking for it, and they e-mailed back with legal forms to sign. There is no reason why you can’t do the same, or if you have a specific question you could ask me. Have you given any kind of consideration at all with converting your main web site in to German? I know a couple of translaters right here which would certainly help you do it for free if you wanna get in touch with me personally. I just wanted to say thanks for posting this! I have a Scythe “Kama Connect” USB to IDE/SATA adapter (http://scythe-usa.com/product/acc/013/scupc1000.html) and it had this problem. Pulled off R15 (same 472 marking) and it’s is working great now. I’ve only had it maybe seven or so years. http://www.somajoy.com/products/ultram.php These articles blogs posts are really good. Good luck with your site in the future. Hey! I noticed that your RSS feed doesn’t work well I thought I should tell you that. My Feed reader failed for your site’s URL. Your style is unique compared to other people I’ve read stuff from. Many thanks for posting when you have the opportunity, Guess I will just book mark this web site. Achievement begins with an optimistic attitude in life. The rates are high in unsecured personal loans. I’m going to without delay catch your own rss feed because i can’t locating your e-mail registration hyperlink or maybe e-newsletter program. Have every? Be sure to allow me to realize so that I might sign up. Cheers. other asset. Can you afford to lend the money. The important thing though is that you get access to the funds you badly need. Thanks for sharing your thoughts. I really appreciate yyour efforts and Iwill be waiting for youir further post thank youu once again. August 26, 2011: ‘Evenings at the River: Feed Your Body. socks to wear in the tea room. Many thanks some other educational web site. The place different could I recieve this form of info printed in a real great process? For sale challenge that I’m just now operating for, and i have already been with the check for this sort of facts. Well it was quite a useful blog post.Thanks for writing this type of information and facts with us.I hope you certainly will keep on enlightening individuals in future also,by way of this type of beneficial information.Continue the good task. This is my first time pay a quick visit at here and i am in facthappy to read all at single place. I take off carefully the resistor but I’m still have the bug, in pentium 4 with Win XP, and when making full clone of disks! – sometimes it reach 100% other times get´s reading error/cannot find the file to be copied ! Any suggestions?! – I’m using USB 2.0 – SATA/IDE interface. bruno504 I don’t think your problem is caused by the read bug on the JM20337. Most JM20337 devices nowadays have the bug fixed by the programming of the flash memory. It is only on old JM20337 devices that have the problem of data errors at about one error every 4Gbyte of data transferred.JM20337. It sounds like to me as if the disks you are trying to read are faulty or you are having power supply issues. I forgot to mention I’m reading a flash drive of 120GB (kingston). but also happens on a new hardisk/sata 500GB. I don’t know if it’s the chip is fulty, It get’s very hot during work! – Did your chip get’s very hot also ? The chip should not get hot. I’ve replaced the JDM chipset, and now it Works great. Thank you for the right tips. Everyone is searching for the perfect smile. With it, one can boost their social life and add a layer of self-confidence. For those not born with one, a visit to an orthodontist becomes the only painful choice.